Online Staffing is the talk of employment. It’s a lot like watching Formula 1 car race. There are over 150 online staffing platforms entering the field, zooming past in a cloud of smoke and dust. As a staffing company you may be wondering exactly the best way to enter the race. But change is hard, and making change a part of your core business model may be more than a little terrifying. With all of the different online staffing options your instinct might be to avoid them all. On the other hand, with a little investment you can learn from these trends and create a customized solution based on your clients, services, and candidates. With your new model you can decide the level of control you can give each portal. And online staffing can work with your business regardless of the systems you use. 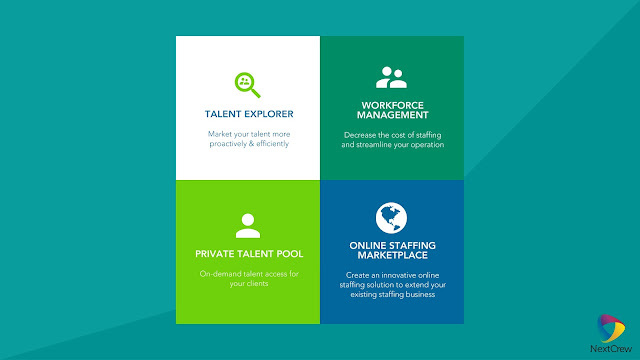 NextCrew offers 4 different ways you can plug-in online staffing without making a major overhaul. Allows your clients to search and explore your available candidates, or Talent, online and simply request an interview which is then facilitated by your recruiter. Talent names are not fully displayed and you can provide the level of access to each of your clients. The profiles can be managed directly by candidates or by your agency. You can even decide which of your talent can be searchable by all or specific clients. You can manage talents efficiently in a fast-moving and high-transaction staffing vertical with a fully integrated scheduling system. The service offers the flexibility of specifying bill rates by client and skill set. There are privacy controls for who can see and apply to jobs, and a built in SMS and GPS check-in function. There is also timesheet approval by clients and staff, and the ability for clients to post jobs. This is the ultimate solution to allow potential employers to connect directly with crew members. It can be set up with PayPal or any other 3rd party payment gateway integration. You can choose to implement either a transactional or subscription fee model. Our robust platform is built with open API architecture. It is white labeled and fully customizable and a 100% cloud based solution. It also has apps for iOS and Android devices. We understand that it isn’t easy to create a strategy to offer new services, but we are here to help and answer any of your questions. Contact NextCrew today! If you’re planning to attend the Staffing World Expo and Convention this week, please say hello to us at booth #524. We are also conducting a webinar next month, so let us know if you would like to join in! Contact maureen@nextcrew.com or call us at (312) 219-2288.